NuWaves’ RF frequency converter designs provide superior performance tailored to the requirements of the system, while utilizing the latest techniques and devices to achieve the best possible technical solution for your application. NuWaves offers market leading size, weight and power consumption (SWaP) solutions for HF to Ka band. We utilize our Frequency Converter Design experience to expand our customers’ hardware capabilities to operate at different frequencies, providing dynamic frequency operation with existing communication systems. 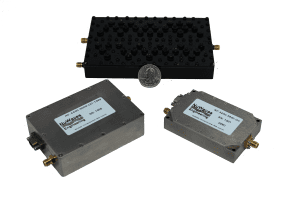 NuWaves was contracted to design, develop, and manufacture a custom C-band transverter system to enable the L-3 Bandit-Miniature Dual-Band Transceiver to operate over C-band frequencies. The finished system includes an L-to-C-band RF upconverter and amplifier module, C-to-S-band RF downconverter module, and a duplexer. The system upconverts and amplifies a fixed L-band IF signal from the Bandit transceiver to an RF signal in the range of 4400-5000 MHz, and then downconverts an RF signal in the range of 5250-5850 MHz to a fixed S-band IF signal for interfacing to the Bandit transceiver. The system was test flown on an Arcturus T-20 UAS. NuWaves developed a high-performance, RF upconverter and downconverter module pair for a major DoD prime contractor. The customer had a need to increase the capability of their existing communications hardware to operate at new frequencies and was budget constrained. 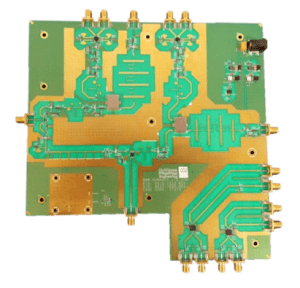 NuWaves was able to offer a significantly cheaper alternative solution than the hardware OEM, adding RF upconverter and downconverter modules to their communication system to expand their range of frequency operation. Based on NuWaves’ Multi-octave RF Upconverter (MORF) and ConvertaWave2 downconverter products, the custom modules featured UHF, L- and S-band coverage and a custom IF, high dynamic range, flat pass band, signal conditioning with high linearity, low insertion loss, and comprehensive programmability. NuWaves was also later contracted to add additional performance improvements to the downconverter module, which included improved linearity, spurious rejection, phase noise, and additional resolution in the attenuation control.The C-band transverter system developed by NuWaves enabled a Bandit transceiver to communicate with a CMDL transceiver over C-band frequencies. Fast paced 7-week development effort. 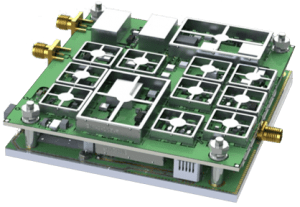 The hardware supports CubeSAT Missions and is needed to enable communication on multiple frequencies and waveforms simultaneously while enabling high power transmissions to overcome losses and canopy penetration. Circuit card assembly for a two channel ultra wideband mixing and signal conditioning unit to be used with a Field Programmable Gate Array (FPGA) based Digital Signal Processor (DSP). Prototype capable of downconverting any signal from 100 MHz to 10 GHz down to baseband.